Absolutely Turn Key Horse Property! Sitting on a gorgeous 5.25 Acre parcel, with sweeping views, beautiful facilities & located across the street from a forest preserve with 5 miles of horse trails, this is a horse lovers paradise! 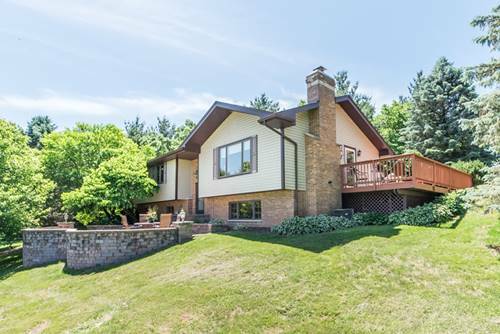 Tucked into wooded frontage, this hillside ranch is deceiving from the front entry. Gracious landscaping flanks the stairs leading to a large wrap deck. Entering the home finds a well equipped "cooks" kitchen w/SS appliances & granite counters, a charming LR w/wood burning fireplace, HW flrs & drop dead views! Lower level features loads of space that lives the way you need it to. Outside finds a brick paver patio & separate firepit that meanders down to the 6 stall insulated horse barn with tack room. Just outside the horse barn is a 73 x 140 Coverall indoor arena. Generous maintenance free Ramm fenced pastures w/room to fence more. Grass outdoor arena as well. Back of property features a running creek in the tree line. Bring the Horses and Enjoy! For more information about 42W858 Bahr, Hampshire, IL 60140 contact Urban Real Estate.